Fiilex is proud to announce that Samy's Camera has been chosen to be among the first Fiilex dealers in the United States. Fiilex is the newest brand from DiCon Lighting and has just launched it's website at the beginning of 2013. 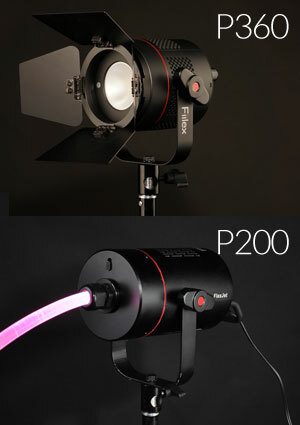 Fiilex announced the P360, an innovative compact light that is color tunable from 3000K to 5600K; and the P200 FlexJet, a fiber optic illuminator has also sparked the creative minds in the industry with it's unique accessories and variety of colors. Samy's is excited to be accepting orders on the P360, the P200 and the Fiilex Light Kits. The single units of the P200 and P360 have just arrived at the Samy's main headquarters. The Fiilex P360 is available for $695, the P200 FlexJet for $795. Two Light Kits are available for preorder. The 3 P360 Light Kit runs $2249 and includes a hard travel case, 3 light stands, 1 barndoors, a 15 inch compact softbox and speedring. The P200 / P360 Light Kit runs $2449, which includes 1 P200 and 2 P360 units, a hard travel case, 3 light stands, 2 barndoors, 1 fiber optic adapter, and 5 feet of fiber optic glow.